Free Eye tests by the Optical Centre's UK qualified optometrists. Early detection of abnormal eye conditions. A & A Optical Centre is an independent family business established in 1984. The Optical Centre has 2 large retail outlets in prime locations in Nicosia, Cyprus. The Optical Centre's optometrists are qualified from British universities and fellows of the "British College of Optometrists (FCOptom.)". A & A Optical Centre pride's itself in its large selection of designer eyewear. Both locations, store a large selection of designer eyewear. Our prime objectives is the care of your eyesight, we aim for early detection of abnormal eye conditions, (such as glaucoma and cataract ) and the prescribing of spectacles or contact lenses to correct the vision. Special attention is paid to your needs, taking into consideration your particular interests or way of life and thereby prescribing the correct frames and lense. 20%-50% on all frames and sunglasses. Shop your favorite brands of designer frames & sunglasses including Armani, Carrera, Christian Dior, Gabbana, Escada, Fendi, Gucci, Jimmy Choo, Marc Jacobs, Persol, Police, Ray Ban and more. 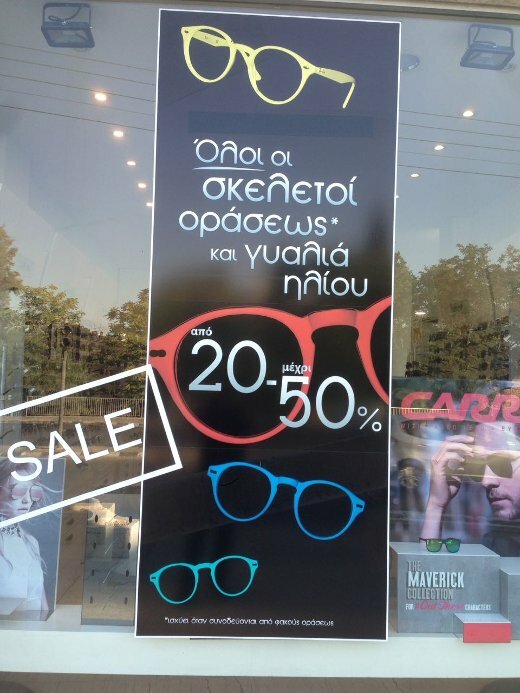 20-50% discount on all frames and on all sunglasses.